Since 1993, SOLVE's Project Oregon has been supporting Oregonians in organizing impactful volunteer projects throughout our state that engage volunteers in restoration and cleanup efforts. Projects begin with your vision and take place in your community. 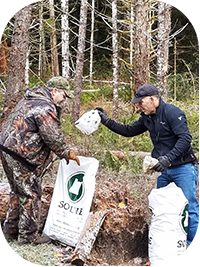 As with all SOLVE programs, Project Oregon supports projects that include litter abatement, the removal of invasive plant species, the planting of native plants, and/or the maintenance of such plantings. While events are the most successful on Saturdays between 9am and 1pm, any day of the week you will find civic-minded Oregonians looking for ways to improve their local communities. SOLVE provides help with project planning and volunteer recruitment, a comprehensive planning guide, and project supplies (litter bags, signage for projects, vinyl gloves, safety vests, first aid kits, education boards, and hazardous waste containers). A limited number of small grants are also available for approved supplies. Oregon's beaches need your help year-round! Our coastline is heavily impacted by litter and marine debris during the winter and spring. Storms and king tides bring in tons of debris and a continuous effort is needed to maintain clean and healthy beaches. Want to make a difference for our oceans? Craving a cup of clam chowder? 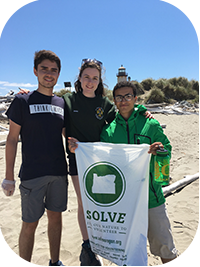 Sign up above as a Project Oregon project leader and SOLVE will help you organize a beach cleanup! Let's come together to help keep Portland clean and healthy! Join us for a Keep it Pretty, Rose City cleanup as part of Comcast Cares Day. We are looking for 200 community volunteers to undertake a massive cleanup of the Brooklyn Neighborhood in Southeast Portland! Free lunch will be provided to all registered participants following the cleanup event. Keep it Pretty, Rose City! is an opportunity to join a city-wide initiative to cleanup Portland. All cleanup supplies and materials will be provided, including litter grabbers and work gloves. Please arrive with closed toed shoes and dressed for the weather. We will be meeting on the west side of Brooklyn School Park located at the corner of SE 16th and SE Center St. Free parking is available on neighborhood streets. Let's come together to help keep Portland clean and healthy! Join us for a Keep it Pretty, Rose City cleanup in Downtown Portland. Volunteers will have a safety debrief before gathering into groups and beginning the cleanup. Families are welcome to attend. A SOLVE staff member will be on site for the duration of the cleanup, assisting in the cleanup activity and speaking about the environmental consequences litter causes. Keep it Pretty, Rose City! is an opportunity to join a city-wide initiative to cleanup Portland. All cleanup supplies and materials will be provided, including litter grabbers and work gloves. Please arrive with closed toed shoes and dressed for the weather. Meet at: SOLVE Office, 2000 SW 1st Avenue, Portland OR 97201. Map of meeting location. For a list of all upcoming Keep It Pretty, Rose City events, click here. Lend a hand with Memorial Day clean-up! We continue to remove invasive species. plant native species, and do whatever we can to improve the cemetery. Students are encouraged to help with a variety of projects on Friday. MHS Science National Honor Society is helping to faciltate this opportunity. Oregon’s historic cemeteries are sites of great natural and cultural value. Discover and care for these special places, with activities at all of Metro's 14 historic cemeteries. With Memorial Day coming up, these cemeteries will be host to many visitors and need your help to prepare. All tools and instruction provided. Projects range from litter patrol and pruning to headstone cleaning and edging. Meet at Gresham Pioneer Cemetery- map To register: https://www.oregonmetro.gov/events/oregon-historic-cemetery-clean-day/2019-05-11 Gresham Pioneer Cemetery Metro’s Escobar and White Birch cemeteries are adjacent. With Memorial Day coming up, our historical cemeteries will be host to many visitors and need your help to prepare. Join the Tigard Breakfast Rotary Club, Trinity Community Church and other community members on Saturday, May 11, 2019 from 9:00 - 11:00 at the Tigard Sunset Pioneer Cemetery for Historic Cemetery Cleanup Day. Tasks include site maintenance, mowing, weeding, raking, marker cleaning. It would be helpful for volunteers to bring any of the following: work gloves garden tools (shovels, rakes, etc) hand tools brooms hand trimmers Parking is available at the cemetery entrance. From 99W turn onto Canterbury Lane to SW 109th Ave to SW Annand Hill Court. Entrance is at the bottom of the Annand Hill Court next to the staircase. There is not a bathroom on site so please plan accordingly. Please join us for the Statewide Historic Cemetery Cleanup Day on Saturday, May 11, 2019 either from 9 or 10 am until 3 or 4 pm. Bring your favorite tools - weedeaters, pruning shears, rakes and/or wheelbarrows, plus gloves & drinking water. Lunch break at noon at the Deadwood Tavern & Market. Coffee, restaurant, gas, convenience store and full bar with lovely 40' live-edge cedar bar. Trained volunteers to help clean headstones will also be on hand – buckets, gentle soap, wood / soft plastic scrapers & soft natural brushes are welcome – NO wire brushes, pocket knives, metal scrapers or harsh chemicals, please. Meet At: Deadwood Pioneer Cemetery. Google maps - https://goo.gl/maps/sNbb8GyXBdR2; turn onto Deadwood Creek Road & right on first gravel drive. *NOTE: Nearest cell phone service is in Swisshome, about 6 miles away. Volunteers are recruited for the statewide Historic Cemetery Cleanup Day on Sunday, May 12, 2019. Meet at Sand Ridge Cemetery at 8:45 and we will break up into teams for various assignments. We plan to work until around 1:00. Tasks include cleaning up landscaping and markers/headstones. We will have some extra tools, but it would be helpful for volunteers to bring any of the following items: * weed eaters * work gloves * rakes or garden tools * hand trimmers * wheelbarrows * brooms * protective eyewear Trained volunteers to help clean headstones will be on hand - buckets, gentle soap and soft, natural brushes are welcome - no wire brushes, pocket knives, metal scrapers or harsh chemicals, please. The entrance to Sand Ridge Cemetery is located at 31997 Sand Ridge Road, Lebanon, OR - map. If you have questions, please call 541-936-2866 or 541-619-6437. Let's come together to help keep Portland clean and healthy! Join us for a Keep it Pretty, Rose City cleanup in the Buckman Neighborhood in SE Portland. Volunteers will have a safety debrief before gathering into groups and beginning the cleanup. Families are welcome to attend. A SOLVE staff member will be on site for the duration of the cleanup, assisting in the cleanup activity and speaking about the environmental consequences litter causes. Keep it Pretty, Rose City! is an opportunity to join a city-wide initiative to cleanup Portland. All cleanup supplies and materials will be provided, including litter grabbers and work gloves. Please arrive with closed toed shoes and dressed for the weather. Meet at: We will meet at the flag pole outside of Revolution Hall, 1300 SE Stark St, Portland OR 97214. Map of meeting location. For a list of all upcoming Keep It Pretty, Rose City events, click here. Join us on your lunch break to pick up litter downtown Portland. Meeting location: Director Park Just bring water and walking shoes! The 27th Annual Rogue River Cleanup is set for Saturday, May 18th, from 8:30 a.m. to 1:00 p.m. on the Rogue River. This is the biggest cleanup project of the year on the river, backed by many local agencies, including Josephine County Parks, the Bureau of Land Management, Josephine County Solid Waste Agency and SOLVE. All participants need to check in at the Whitehorse Park Boat Ramp 8:30 a.m., where they will receive garbage bags and gloves, along with a raffle ticket. Then they can disperse to pick up trash, and pull weeds along the river, with various dropoff spots for bags. People may float the river and pick up trash, or go to a specific park, or area of focus. A volunteer appreciation barbecue will be held at Indian Mary Park after the event. The barbecue will include live music and a raffle of various items from local businesses. Last year over 200 volunteers came out to clean up the Rogue River! Cleaning up the river benefits wildlife, reduces human health risks, and increases quality of life. Meet at the Whitehorse Park Boat Ramp to check in at 8:30 AM - Click here to go to Google Maps For more information, please call Josephine County Parks at 541-474-5285, or email parks@co.josephine.or.us. Independence and Monmouth residents are encouraged to show support by beautifying their own properties and volunteering for the greater community-wide cleanup. This event will include such projects as park restoration, riverbank cleanup, and downtown and roadway beautification. We will also be hosting a cost-effective refuse and recycle collection for our communities. Activities include: litter cleanup, vegetation management and refuse collection. Water, lunch and gloves will provided, please dress appropriate for the weather and anticipated projects. Volunteers should arrive by 8:30 AM, to assist with being able to get volunteer vehicles out of the location if not working at the refuse collection portion. We have moved the volunteer headquarters and refuse collection site to 10 Deann Dr., Independence, Oregon. 10 Deann Dr. is located off of N. Main St., or Hwy 51 at the north end of Independence, OR.. Turn in at the A-1 Market and go through the apartment complex and past the roundabout, directional signs should be in place. Please call Sue at 503-837-1127 if you have questions. First session from 9:00-11:30AM, second session from 12:00-2:30PM, birders meet at 7:00AM Join us for the largest regional Eco-Blitz! Novice and accomplished community scientists gather in thematic teams to map and document the hundreds of species living at the Delta alongside professional scientists, using the iNaturalist app. Please let us know if you would like to be in a Spanish speaking group. Registration coming soon. ¡Únase a nosotros para el Eco-Blitz regional más grande! La gente que le interesa por la naturaleza se reúnen en equipos temáticos para mapear y documentar los cientos de especies que viven en el Delta, utilizando la aplicación iNaturalist. No se nececita experiencia. Si le interesa estar en un grupo que habla espanol, por favor Contacte sara@sandyriver .org o 971-325-4224 * Spanish speaking staff present. Personal que hablan español presente en estos eventos See www.sandyriver. org and Facebook @Sandywatershed for updates and registration info. All events are beginner and family friendly. For plantings, gloves and tools are provided. Wear long pants, close toed shoes and bring rain layers and a water bottle. On Saturday, May 18, 2019 bring your friends, your family, your group and join in! Meet us at any one of our locations and pull weeds. Our site coordinators and on-site noxious weed experts will assist you in identifying native plants and noxious weeds. Let’s Pull Together to remove weeds from the places we love! Let’s Pull Together was started in the City of Bend and is making its way across the state. The May 18 events, taking place during Oregon’s Invasive Weed Awareness Week, are hosted by members of the Benton County Cooperative Weed Management Area (CWMA). The mission of the Benton County CWMA is to coordinate community-based efforts against those invasive species that have the potential to cause ecological and economic harm in Benton County. Gingles Cemetery is located in Benton County, Oregon. It probably originated as a family burying ground. The cemetery is one of the oldest in Benton County and is on the former Donation Land Claim of James Gingles. The earliest death date marked on a tombstone is 1852, when Hiram Hardie was buried. Since there are unmarked graves, it is possible that there were earlier burials. It is said that the first burial here was a Mr. Miller, a brother of Mrs. Gingles, who died just before reaching Benton County on his way from the east. The cemetery was never plotted and after the building of nearby North Palestine Church in the 1880s, and the establishment of a cemetery there, Gingles Cemetery fell into disuse. Rick Pyburn, who found that some of his relatives were buried there, purchased the cemetery from the prior owners for one dollar and has been working on restoring the grounds. The property is entirely surrounded by privately owned land and Rick negotiated with two of the owners to allow him to build a drive to access the cemetery. http://www.ginglescemetery.talkinghawk.com/ Project Activities: The cemetery is very overgrown and lots of underbrush, scattered branches, and duff needs to be cleared out. Be prepared for lots of physical activity such as raking, cutting and moving debris. The first group of volunteers to arrive will be tasked with creating a pathway for others to use to dispose of debris. Meeting Location: The owner of the farm of the drive into the cemetery will allow volunteers to park at their barns and then a few vehicles will shuttle folks closer to the cemetery. What to Wear and Bring: Poison oak is pervasive so you must dress in long sleeves and long pants. Bring good heavy gloves, loppers, hand saws, and rakes. Wear boots or heavy sneakers/shoes. Food and other available items: A port-a-potty will be rented for the day. Lunch, snacks, and drinks will be provided. We will purchase cleaning cloths to wipe your face and hands in case you get into the poison oak. Some equipment may be available but it is best if you can bring your own. Meet at 9 AM, official end is at 4 PM with lunch provided and breaks throughout. This trail system is a popular gateway to natural areas, come show it some love! The activity: patching damaged sections of trail, clearing vegetation and weeds from trail edges. We’ll be shoveling gravel and moving it up to 1 mile in motorized toters. Hand tools will be used to apply gravel to trails and control trailside weeds. What it takes to participate: Being active at your own pace for several hours. Hiking up to 6 miles on uneven natural surface trail where some poison oak is present, carrying hand tools and gear. Shoveling, steering a motorized toter for up to one mile, lifting, bending, raking. Event co-hosted by Benton County Cooperative Weed Management Area members: Greenbelt Land Trust, Heart of the Valley Runners, and Benton County. Poison oak may be present, please bring protective gloves or use those provided. Dress for the weather and wear long sleeves, long pants, and closed-toe sturdy shoes. Specific directions to the event will be sent to all registered volunteers. We will be meeting at a site near Bald Hill Farm, Corvallis, OR. Recommended for ages 16+. All volunteers under 18 must be accompanied by an adult. Let's Pull Together - Save our Grand Oaks! Cougar Mountain Riders Association 9th Annual Woods Clean-Up is on Saturday, May 18th! Got an hour or 2 you can spend in the woods? Perfect! We are partnering with SOLVE again this year, hope to see you there! Preserving, leveling and cleaning headstones and gravesites in historic pioneer cemeteries. Volunteers are needed. A workshop will be held Saturday, May 18th, 2019 hosted by Polk County Cemetery Savers with demonstrations of cleaning and repair. Work will begin Tuesday, May 21 and last approximately 2 months in our Odd Fellows Cemetery. The Upper Cemetery will be scheduled at a future date. Rock Point Pioneer Cemetery Annual Clean-Up and Pot Luck Gold Hill, Oregon Right next to Del Rio Vinyards Join the Pock Point Pioneer Cemetery Board of Directors for another fun and rewarding Clean-Up Day! Saturday, May 18, 2019 from 9:00 AM - 2:00 PM (Or as long as you wish to help out.) We will have our Pot Luck Lunch at noon. We will provide Chicken, plates, utinsils and napkins. Bring a side dish if you choose but not nessasary as there is always plenty. We will provide water and various drinks for the day. We will have our Annual Board Meeting directly following Lunch and all who are intrested are encouraged to attend. We will provide fuel for your mowers, weed eaters or any other machinery you wish to bring. Please bring your work gloves (we have some to loan if you don't have any), and your favorite work tools. See you there! Volunteers will pick up trash, debris, and general clean up of sidewalks. Everyone. Every age. Every Ability Level. This is a family-friendly, inclusive volunteer event. Two dumpsters will be availabe for residents and neighbors of Portsmouth and University Park neighborboods to drop off "bulky waste" household items not suitable for reuse or recycling. Volunteers are needed onsite for bulky waste dropoff. Small groups will also walk through the neighborhood for general litter pickup. Please bring work gloves if you have any, but we will have supplies onsite as well. Please join in and sign up to help! Thank you for your interest in volunteering! This summer Clark County Parks, in partnership with SOLVE, will host a litter cleanup series at Frenchman's Bar park. The goal of this series is to keep litter from making it's way into local waterways. You do not need experience and groups, families and individuals of all ages are welcome. A cleanup will be held every 4th Saturday in May, June, July, August, and September. Gloves, tools, water and snacks will be provided. Please bring a reusable water bottle if you have one. Parking fees are charged at this park, but volunteers can pick up a free volunteer activity pass at the fee collector booth or with your volunteer leader on the morning of the event. Volunteers will be emailed information prior to each event indicating meeting location and additional details. Volunteers should wear long pants, closed toe shoes and dress for the weather. These events are open to all ages and are a great way to help keep litter out of our waterways. Youth 13 and younger can volunteer with a parent or guardian. Teenagers 14 to 17 years old need to have signed minor consent form to volunteer without a parent or guardian: If you have any questions please contact the Volunteer Program Assistant, Dora Hernandez, at 360.397.6118 ext. 1679 or via e-mail at Dora.Hernandez@clark.wa.gov. Join us at the 1st Annual Montavilla Graffiti & Litter CleanUp Day On Saturday June 1st, 9am to 1pm, help pick up litter in the Montavilla neighborhood, clean up graffiti at residential intersections people have “adopted”, and at locations in our neighborhood. This event is sponsored by the Montavilla Neighborhood Association, KINK Radio’s “Paint the Town Green” event, Metro, SE Uplift District Coalition, and the City of Portland’s Graffiti Abatement Program and Keep it Pretty Rose City anti-litter campaign.Check-in at Montavilla Park on NE Glisan and 82nd. Team Leaders check in at 8:30 AM; volunteers check in at 9 AM. Coffee & snacks provided. After short training and safety talk. Cleanup starts at 9:45ish AM. Volunteers under 18 need an accompanying parent or guardian to register for them. We Need Team Leaders: Email dylan@montavillapdx.org if you can help as a Team Leader. If you have participated in a SOLVE event before and comfortable giving directions to people, you’re qualified. What to wear and bring: CleanUp will take place rain or shine. Check the weather forecast and dress accordingly. Open-toe shoes not recommended. All supplies needed to pick up litter and clean graffiti will be provided. What you will be doing and where: Litter Teams: Cleaning litter from the street and residential areas, we'll start on 82nd then expand outwards. Graffiti: If you want to focus on graffiti - - either "adopting" an intersection in Montavilla near where you live OR help cleaning or painting over graffiti on utility poles - - we’ll give you the supplies, training, and help to remove graffiti. Please register. on this seprate Graffiti Sign Up form if you want to focus on graffiti, so we can assess the amont of supplies we need and can create a map of intersections being "adopted." Lunch / raffle prizes: Coffee & breakfast snacks and lunch provided. Raffle with prizes donated by local businesses during lunch. Paint the Town Green Litter and Graffiti Cleanup in SE Portland On Saturday June 1, 9am to 1pm, help pick up litter and clean up graffiti. Come meet your neighbors and grab a breakfast snack, then go and make our neighborhood more beautiful! Meetup is 9 am at Super King Buffet at 5015 SE 82nd Ave, north parking lot. We will have a safety talk and hand out clean up supplies and tools.What to Wear and Bring: CleanUp will take place rain or shine. Check the weather forecast and dress accordingly. Open-toe shoes are not recommended. All supplies needed to pick up litter and clean graffiti will be provided by SOLVE. Please bring a resuable water bottle if you can. Graffiti: If you want to focus on cleaning graffiti (painting over it or removing it with a safe citrus-based solvent) or removing stickers, we’ll give you the supplies, training, and help to remove it. Morning Snacks: Water, coffee, and bagels (provided by Henry Higgins Boiled Begels) at the Super King Buffet gathering location. Lunch: Lunch will follow at Glenwood Park, 1 block south of SE Duke St and SE Clayburn St. Join us to share in food and conversation with surrounding neighborhoods to debrief about our experience and enjoy each other's company! Minors: Teens under 18 need to have the waiver signed by an adult. Teens under 15 need to be accompanied by an adult, as well as have the waiver signed by an adult. Waivers can be printed and pre-signed before the event; just bring it with you. Qualifies for Portland Public School's Community Service Requirement. This event is sponsored by the Mt. Scott Neighborhood Association, KINK Radio’s “Paint the Town Green” event, Metro, SE Uplift District Coalition, the City of Portland’s Graffiti Abatement Program and Keep it Pretty Rose City anti-litter campaign. News Seasons Market. Pepinos Mexican Grill and Aprisa Mexican Cuisine are providing lunch. Join KINK, Metro, the City of Portland Graffiti Abatement program, SOLVE and Lents for the Paint the Town Green clean up event on Saturday, June 1st from 9 am to 1 pm. We'll be cleaning up litter and graffiti in various SE NEIGHBORHOODS throughout the morning, and we're looking for volunteers to join us. You don't have to live in those neighborhoods to help clean them up! We'll provide the supplies along with snacks AND lunch; you provide the energy. We will meet at Glenwood Park for breakfast snacks and a quick training, then start the clean up on 82nd toward Flavel. At the end of the clean-up, we will have lunch back at Glenwood Park. Sign up for Paint the Town Green today! Check-in at Glenwood Park in Lents Minors: Teens under 18 need to have waiver signed by an adult. Teens under 15 need to be accompanied by an adult, as well as have waiver signed by an adult. Waivers can be printed and pre-signed before the event; just bring it with you. Qualifies for most public schools' Community Service Requirement . Team Leaders check in at 8:30 AM; volunteers check in at 9 AM. Pastries and snacks provided after short training and safety talk. We Need Team Leaders: Email marciaddy@outlook.com if you can help as a Team Leader. If you have participated in a SOLVE event before and are comfortable giving directions to people, you’re qualified. What to Wear and Bring: CleanUp will take place rain or shine. Check the weather forecast and dress accordingly. Open-toe shoes not recommended. All supplies needed to pick up litter and clean graffiti will be provided by SOLVE. Please bring a resuable water bottle if you can. Graffiti: If you want to focus on cleaning graffiti (painting over it or removing it with a safe citrus-based solvent) or removing stickers, we’ll give you the supplies, training, and help to remove it. Morning Snacks/Lunch: Water, pastries, and snacks (provided by Bella's Italian Bakery and New Seasons) at Glenwood Park, with lunch to follow (same location). Join us to share in food and conversation with surrounding neighborhoods to debrief about our experience and enjoy each other's company! Join us at the June 1 Hawthorne, Division and 26th & Clinton Graffiti & Litter CleanUp Day On Saturday June 1, 9am to 1pm, help pick up litter on Hawthorne Blvd and Division St in the Richmond neighborhood (between SE 29th and 50th/52nd Aves. ), clean up graffiti at residential intersections people have “adopted”, and at locations along Hawthorne and Division in Richmond. This event is sponsored by the Richmond Neighborhood Association, KINK Radio’s “Paint the Town Green” event, Metro, SE Uplift District Coalition, the Division-Clinton Business Association, Hawthorne Blvd Business Association, the City of Portland’s Graffiti Abatement Program and Keep it Pretty Rose City anti-litter campaign, and News Seasons Market. Pepinos Mexican Grill and Aprisa Mexican Cuisine are providing lunch. Check-in at Central Christian Church, 1844 SE Cesar Chavez Blvd. Minors: Teens under 18 need to have waiver signed by an adult. Teens under 15 need to be accompanied by an adult, as well as have waiver signed by an adult. Waivers can be printed and pre-signed before the event; just bring it with you. Qualifies for Portland Public School's Community Service Requirement . Team Leaders check in at 8:15 AM; volunteers check in at 9 AM. Coffee & snacks provided. After short training and safety talk. Cleanup starts at 9:45ish AM. We Need Team Leaders: Email allen_field@yahoo.com if you can help as a Team Leader. If you have participated in a SOLVE event before and comfortable giving directions to people, you’re qualified. What to wear and bring: CleanUp will take place rain or shine. Check the weather forecast and dress accordingly. Open-toe shoes not recommended. All supplies needed to pick up litter and clean graffiti will be provided. What you will be doing and where: Litter Teams: On Hawthorne, there will be 4 Teams picking up litter, cigarette butts and sharps, and 4 Teams on Division. On each street, 2 Teams will walk west from Cesar Chavez Blvd to 29th Ave and 2 Teams will walk east from Cesar Chavez to 50th or 52nd, with 1 Team on the north side of the street and the other Team on the south side. There will also be a Team for the 26th & Clinton area. Each of the 9 Teams will have a Team Leader. Metro will be collecting bags of litter at designated corners. Graffiti: If you want to focus on cleaning off graffiti (painting over it or removing it with a safe citrus based solvent) or removing stickers, we’ll give you the supplies, training, and help to remove it. Morning snacks/Lunch / raffle prizes: Coffee, breakfast snacks (by New Seasons) and lunch provided Pepino's Mexican Grill. During lunch, we'll raffle off prizes donated by local Hawthorne and Division businesses. When you return to the church and return the supplies, we'll give you a free raffle ticket. Join PGE and SOLVE as we help to keep the Starlight Parade one of the cleanest and greenest in America! Volunteers will walk the parade route following the last float, collecting filled SOLVE bags of trash and helping to keep parade-goers off the route. All volunteers must be 16 years of age or older, and volunteers must wear sturdy running or walking shoes, no flip-flops. All collection volunteers are welcome to reserve a space on the PGE bleachers to watch the parade. This is an exhilarating experience and good physical mobility is required. Volunteers must be able to walk the entire length of the 2.25 mile parade route at a brisk pace or occasional jog to keep up with the trash trucks and street sweepers. Please meet us at the corner of NW Park and West Burnside between 7pm and 9pm. Look for the large PGE tent next to the bleachers. We will volunteer until 11:30 PM. We can't wait to see you there! We are picking up litter and illegally dumped waste outside of Sunriver, Oregon, at a target shooting/dispersed camping area named "Camp Abott." June 8, 2019 from 9am to 4pm or so. Location: approximately 0.7miles east on the Lava Cast Forest Road (aka nf-9720) from the Century Drive/Sunriver exit of Hwy 97; it's a large cinder pit area on the south/right side of road. *Please wear long pants, close toed shoes; and bring your own eye protection/sunglasses, other sun protection, water, and snacks. * We'll provide the garbage bags and disposable gloves! Facebook event page: https://www.facebook.com/events/374076433433619/ Please email kaylasulak503@gmail.com with questions, etc. 5th Annual Clean Up the Mountain Event To Be Held on June 22, 2019 The Yamhill County Sheriff’s Office, in cooperation with the BLM (Bureau of Land Management) and SOLVE (Stop Oregon Litter and Vandalism) invites the public to come help clean up public lands at the 5th Annual Bald Mountain Forest Clean-up event on Saturday, June 22rd, 2019. We ask you to meet at the Sheridan Peak kiosk on Bald Mountain Road at 8:30 a.m., to pick up trash large and small. We will be serving BBQ Hot Dogs, chips and water for all the volunteers beginning at 11:00 a.m. Volunteers should wear a long sleeve shirt, long pants, work gloves and sturdy shoes or work boots. Bring rain gear, just in case! Come get your hands dirty, meet some wonderful people and help keep our forests clean! Since 2015, volunteers have removed over 25 tons of garbage and over 180 tires from the forest. Although a large amount of garbage has been removed over the last four years, dump sites in the forest continue to be a major issue. Please join us for this year’s event! Unsightly garbage is harmful to plants and animals. It can pollute water sources and promote the growth of noxious weeds. Dumping on private forest lands has resulted in many land owners closing their lands to public access. Make a difference and join us on June 22rd!